The stories we tell are powerful. And they matter. During the Victorian era, when photography exposures were painfully long, it was common practice to take photographs of children by placing them on the laps of their mothers, who were completely obscured by a veil. The intent, of course, was to keep a squirmy child calm during the thirty-second-long camera exposure. To modern viewers, these “Hidden Mother” images appear more than a bit creepy, with the shadowy outline of a woman or a pair of disembodied hands lurking like ghostly imprints behind the infant. Though they seem rather macabre to viewers today, the photos, on a metaphorical level, are apt representations of a woman’s role throughout history—all too often she has been relegated to the background, presented as no more than an obscured figure supporting others, unseen for her own merits. Historians, thankfully, are beginning to remove that veil, allowing her to step forward and speak of her own experience in her own words—turning his-story into their-story—bequeathing to us all a truer, fuller, richer version of events. Walk through any Civil War museum of this country, and you’ll find army uniforms, battle flags, percussion rifles, Colt revolvers, war medals, and photographs of soldiers. Here and there, tucked into corners, you may be lucky enough to find displays featuring a handful of women who contributed to the war effort. You would never guess from looking at such presentations that the vast majority of people impacted by this conflict were not male military leaders but civilians, whose perspectives describe a large part of what this country endured in the long years that stretched between 1861 and 1865. And yet, behind the objects held within display cases of glass, many stories of women are waiting to be told. This straw hat, worn by a soldier to his death, was crafted by the hands of his sister; that mending kit, carried by another soldier, was cut and sewn from the fabric of his sweetheart’s dress; the ammunition cartridges on display were rolled by female factory workers. 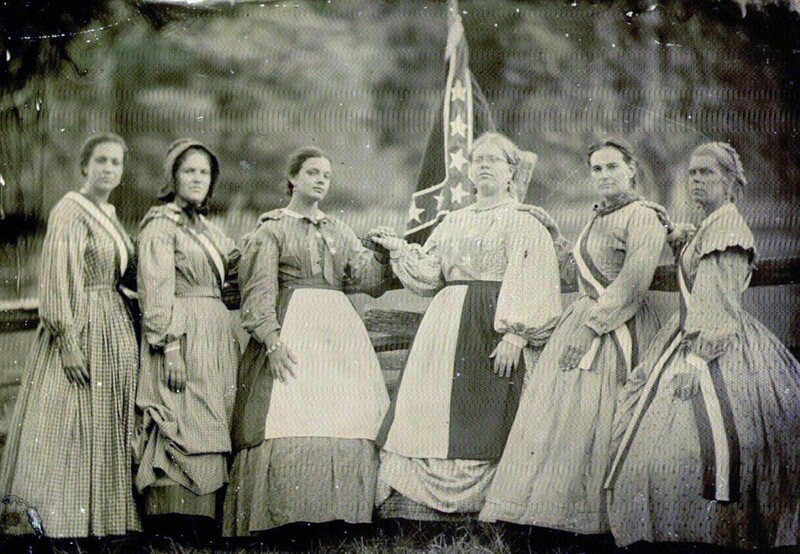 Women designed and created the flags men carried into battle; they braided gold epaulets for uniforms, while black female hands helped pick the cotton that clothed the entire nation. Female nurses cared for soldiers who fell on battlefields, then sent locks of hair and personal items to comfort mourners. Survivors cherished these items and, in many cases, donated the majority of them to museums to preserve their loved ones’ memories. But beyond the war stories we’ve heard most often, women also fought in the war disguised, recorded central events in journals, counseled generals on strategy, worked in factories, engaged in acts of espionage, smuggled medicines across enemy lines, organized, fundraised, and helped finance the war. In post-war years, women cared for the veterans who returned home, buried those who didn’t, and listened to male survivors talk about their service. To support these veterans, they held ceremonies, erected monuments, and persuaded legislatures to declare holidays. These dedicated women might have accurately been called business consultants, philanthropists, medical personnel, event coordinators, and psychologists; and in later generations, they would have been properly compensated. The original premise of the war, from the perspective of the United States, was a belief in the unity of this nation. They fought for the very idea that if the Confederacy formed a separate nation, something would be lost to all sides. There is no question that our modern nation has landed firmly on the side of the North on the issues of slavery and freedom for all. Yet the South’s emphasis on local government and strong communities continues to play a fundamental role to this day. The African American culture adds a narrative of a people wrenched from their roots yet determined to draw strength and overcome. As a nation, we are better off for the unity of all of these values, taken together, taken in balance. 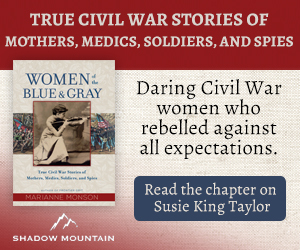 Throughout this book, I’ve tried to stay true to the story and perspective of each woman’s view of the war—attempting to treat each story in turn as she would wish it to be treated. I believe the fissures in our country are destined to remain until we as Americans face our past and listen deeply to perspectives too long ignored and overlooked—finding from the history a way to step forward together, fully entitled to our stories as well as to our futures. 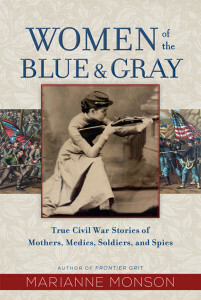 Women of the Blue and Gray gives voice to the women who endured this country’s greatest conflict. It is an attempt to rescue from the shadowy corners of war incredible stories of women that remain relevant to our world today. So listen now, as the veil is pulled aside, and she begins to speak. Tags Africa, American, Americans, army, battlefield, civil war, Confederacy, espionage, general, lance, military, museum, NATO, NSA, OSS, POW, Reviews, the civil war, Tory, United States, WIN, women of the civil war.